If you listen to the likes of Canon, Nikon and Sony, you will need to upgrade your DSLR every few months. It seems that before you can get used to your brand new camera, the manufacturers unveil a new set of “must-have” features. Remember the megapixel wars? Without any established or uniformed way to differentiate the new model from the old models, camera manufacturers started an arms race with megapixels. We could create great images with five MPs, but camera manufacturers told us those weren’t enough. We needed six MPs, then eight, then 10, and 12. The latest count from Nikon and Sony, 36 Megapixels for the D800 and A7r respectively. At some point the escalation became overkill, but without the ability to say my megapixels are bigger than yours, how do we choose? Here are seven features worth evaluating before you upgrade. ISO is the new megapixel, or so it seems. Each year, the new ISO range climbs higher and higher, leapfrogging the previous models. ISO, of course, is your camera’s sensitivity to light. The higher the ISO, the darker the scene you can photograph without a tripod, because your camera can capture correct exposure with faster shutter speeds. Like film, higher ISOs usually come at the expense of image quality. In film, we’d see speckles we called grain. In digital, we call those imperfections, noise. Newer cameras have been extending the ISO range with each release giving us not only wider ranges but the ability to shoot at higher ISOs without seeing as much noise. This year, Nikon released its new flagship DSLR, which sports an ISO range from 50 - 409,600 equivalent. It’s scary to think what might come next. If I’m evaluating ISO of a new camera, I’d want a minimum of double the range of my current camera. That gives you an extra stop of light. I’d want more than double ideally, but less than that isn’t worth the hassle. In the last five years, most LCD screens have only increased from 2.5“ to 3”, but in that same time, the screen dots jumped from 230,000 to 1,040,000. As a result, when you review your images, they will look much clearer and sharper. You will also see the results when you use live view to compose or shoot video. If you are upgrading from one of the early models – 2008 time frame – you will notice a significant difference. From a newer camera, the improvement might not be a good enough reason to upgrade. A fully articulating screen is one quality-of-life feature that doesn’t get enough credit. These are the screens that can flip out and swivel. Most LCD screens are fixed to the backs of cameras. Once you shoot with a screen that moves, you will wonder how you ever lived without it. It’s great for shooting low angles without having to get your face down on camera level, or shooting over crowds without needing to tiptoe. Just move the camera into place and pop out the screen and point it toward you. This is a feature you won’t regret. Body construction and design are a couple of the more noticeable differences between an entry level DSLR and some of the more advanced models. Your entry level camera is smaller and compact. It is also much lighter, since it is constructed of plastic. Further up the range to prosumer and professional cameras, the bodies are larger and constructed of the more durable magnesium alloy. These bodies boast features like weather seals that are also dust resistant. Is the larger body worth the upgrade? That depends. If you are planning to give your camera a workout in a wide variety of unpredictable conditions, then you will definitely want the sturdier body. Wedding photograpphers, photojournalist and nature photographers have all come to appreciate the extra protection. If you value a smaller footprint and plan to shoot in controlled environments, the lighter cameras might be good enough for you. The effect of a newer image processor is a little more difficult to quantify, but it doesn’t stop the camera marketers from bragging about it. Every couple upgrades, you’ll see them extolling the virtues of their newer processor. Generally speaking, this provides a more responsive camera, as images are recorded much faster with each improved generation. You can also expect better image performance, as the new processors can yield better image ISO performance as well as greater dynamic range. Two generations of improvement should be enough to realize the quality-of-life improvement. Better auto focus can affect both your quality of life and the quality of your image. Early DSLRs offered just three auto focus points. It kept the camera simple, but photographing fast-moving or unpredictable subjects was definitely more challenging. Today, it is not uncommon to see an entry-level DSLR with as many as 39 auto focus points with 3D capability. If you are photographing birds in flight or action sports, you will definitely appreciate the flexibility this provides. If you are focused on flowers in a botanical garden, it might not be as important. My first DSLR was a Nikon D50, which I quickly upgraded to get the more advanced features in the Nikon D200 menu. I wanted the ability to control multiple speedlights wirelessly from my camera. In fact, I found a signficant increase in the overall capabilities available to me in the advanced Menu options. If you only need to point and shoot, a simple menu might be enough. If you anticipate using more sophisticated set ups, then a more extensive Menu will be worth the upgrade. 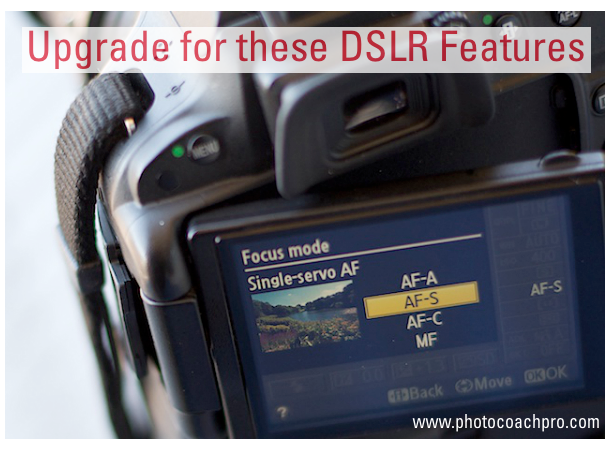 There are quite a few features that are worth the upgrade, but are they worth it for you? Of course that depends on what you will be shooting and where. These seven features will provide enough of an improvement in your quality of life or image quality that you won’t be disappointed.